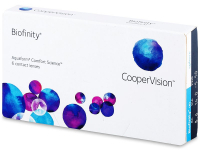 Biofinity contact lenses are monthly lenses produced by CooperVision. Their high water content and oxygen permeability make them suitable for occasional extended wear. 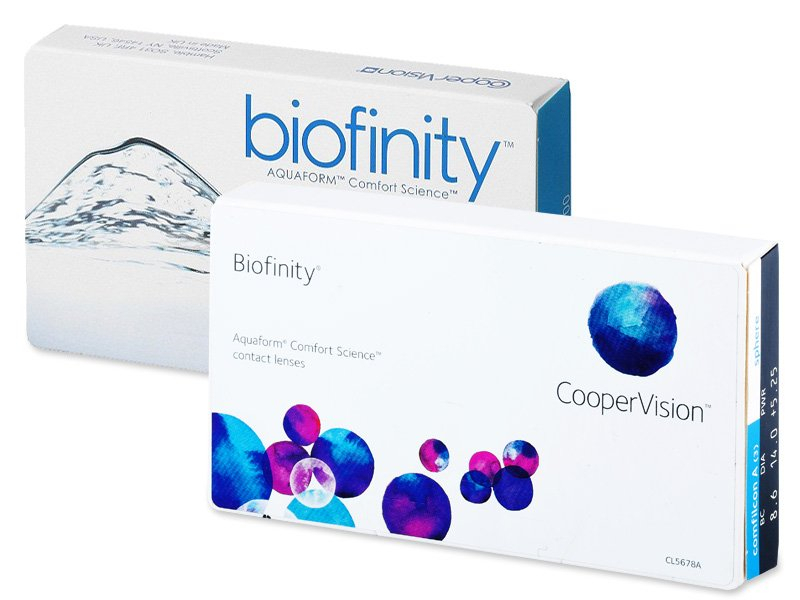 Biofinity are monthly silicone hydrogel contact lenses manufactured by CooperVision. Their material combines a high water content with excellent oxygen permeability. Biofinity contact lenses’ balanced ratio of water content and oxygen permeability make them suitable for extended wear. Biofinity lenses have an aspheric front surface, which improves the optical properties of the lens. 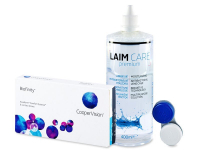 It provides visual acuity in low-light conditions and enables the correction of lower levels of astigmatism and presbyopia without the use of a cylinder. Rounded edges help to increase comfort and reduce eye irritation and subsequent redness. The profile of the rear side of the lens helps to spread the pressure across the eye surface for better comfort. How do Biofinity contact lenses work? Oxygen and other metabolites are able to pass through the lenses thanks to their high water content. The more water the lens contains, the better the oxygen permeates through it. This transfer of oxygen occurs through microscopic channels in the lenses. The unique AQUAFORM Comfort Science ™ technology uses a new silicone material, which results in more efficient oxygen permeation through the lens. This material links the hydrophilic (water-binding) and silicone (water repellent) components in a manner that creates a naturally moist surface. The water content is evenly balanced throughout the entire volume of the lens. The material of the contact lenses does not contain ions (electrically charged particles). The lenses are therefore able to resist the accumulation of protein and lipid deposits left by natural tears and external environmental factors. Note: Biofinity contact lenses are intended for daily wear, but are also suitable for occasional sleeping or extended wear. This method of use should first be approved by an eye specialist. can i wear one pair 30 days ? These lenses are monthly style lenses with a replacement schedule of 30 days. Providing that you follow the proper cleaning & care procedure daily, one pair should last one month. Hello Iqra, yes, you are correct. You will need to buy 2 Biofinity 6 pack to give you a 6-month supply. Please let us know if there's anything else we can help you with. Is the biofinity wetting agent better than other brands? Hi Steve, Thanks for your question. 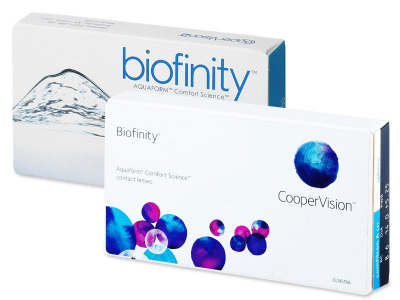 Biofinity's wetting agent helps to maintain moisture, as well as promotes oxygen permeability – 2 of the most important factors in contact lens comfort level. Both the water content and level of oxygen permeability are very high in Biofinity lenses, compared to other brands. Can I wear Biofinity if I have seasonal allergies? Hi Marta, Thank you for your feedback. We're pleased that you are satisfied with the Biofinity lenses. I've been using Biofinity for a few months, and I read that they are ok to wear continuously. Can I sleep in Biofinity contacts overnight? And how many days can I wear one pair? How can I be sure it's safe for my eyes? I am quite lazy to remove them every day, but I'm worried about the safety. Thank you. Hi Taylor, Biofinity lenses are approved by the manufacturer for overnight wear for up to 7 days and nights, but this type of wear requires consent and instructions from your optician. If worn correctly, continuous wear lenses are perfectly safe and comfortable. I trust Biofinity, but was a little unsure ordering because the price was so low. Turns out they're perfectly authentic and exactly the same as the ones I was getting from my optician for 3x as much. Great lenses, wonderful service. Many thanks, I'll return to make another order. I've had no problems with extended-wear since I switched to Biofinity. Really comfortable, even towards the end of the month. Hi, Are these lenses better than the Dailies Total 1? I want to purchase the best lenses for dry eyes, please can you help or recommend which one to purchase?